Because your body shouldn't slow you down. Our Athletic Therapist will work with you in a private setting to establish what your injury is, the cause, and the best course of rehabiliation for you. 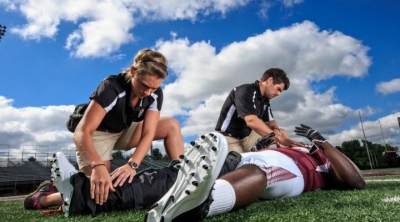 From public events to sports teams, having an athletic therapist on hand to deal with medical emergencies is often nessesary. Athletic Therapy clinic appointments are run out of Tower Chiropractic and Massage where Kristina, the owner, works along side massage therapists, an acupunturist and a chiropractor to ensure that whatever you need to best heal is being done for you. This multidisiplinary approach ensures you recieve the best care and leave feeling great.